You are here: Home / ARTICLES / Are Single or Dual Voice Coil Subwoofers Better? When it comes to buying subwoofers, a lot of people have questions or make assumptions about the benefits and drawbacks of single voice coil and dual voice coil versions. Understanding the differences between them requires a slightly enhanced understanding of how an amplifier works. We cover both topics in this article. An amplifier is a simple device that takes an audio signal (from your radio, for example) and increases the voltage. That’s it. You may (logically) be asking yourself, “Why do we call it a power amplifier?” We get an increase in power because the speakers we connect to the outputs of the amplifier have a low impedance. In car audio, we typically see loads between 1 and 4 ohms. This low impedance, combined with the increased voltage of the audio signal in the amplifier, causes relatively large amounts of current to flow through the voice coil of the speaker. This current flow causes a magnetic field and, subsequently, the voice coil moves toward or away from the magnetic field created by the stationary magnet on the speaker. Let’s use an example of an amplifier that has a peak output voltage of 20 V. We don’t need to worry about the fact that this is an alternating current signal – we will examine this at a single point in time. With 20 V applied to our voice coil, let’s say we have a 4 ohm impedance on this coil. Ohm’s law states that a potential of 20 volts applied across a resistance of 4 ohms will result in 5 amp of current to flow. 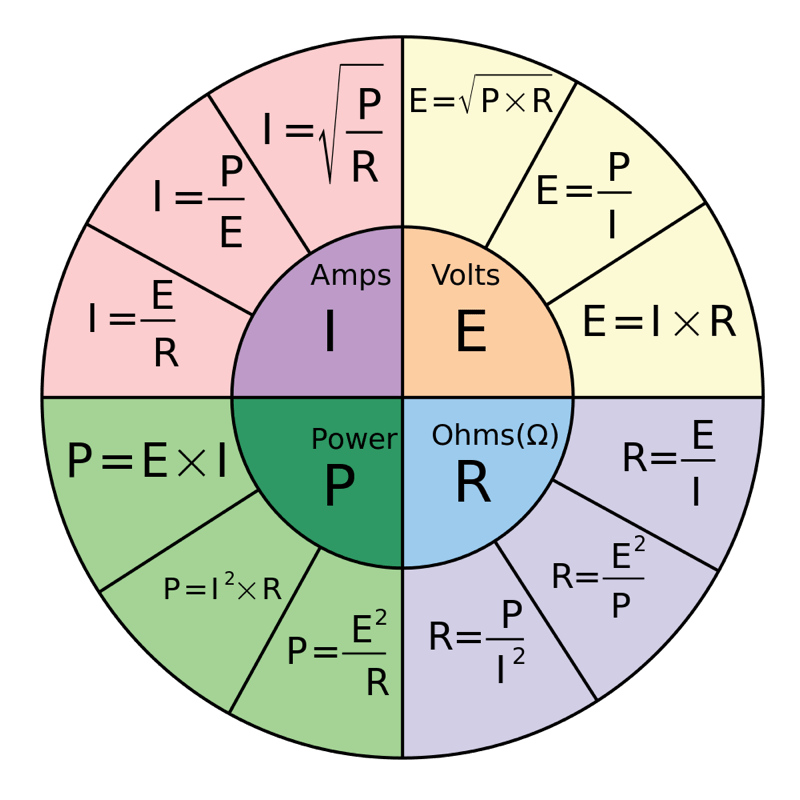 Using the equation P (Power) = Voltage x Current, we get 20 x 5, or 100 watts of power. If we change the impedance of the load to 2 ohms, we double the current to 10 amps, for a resulting power level of 200 watts. If you look at the specifications for an amplifier, especially a subwoofer amplifier, you will see power ratings at different load impedances. In most cases, unless the voltage of the power supply in the amplifier is adjustable, amplifiers will make more power as the load impedance decreases. Deciding which subwoofers to buy depends on the amp you are using and the number of subwoofers you are going to use. You want to choose a combination of subwoofers that will let you wire the voice coils together to an impedance that will allow the amp to make the power you want. Let’s look at several examples. We have the option of two different fictional subwoofers, each rated for 750 watts of continuous power handling. One subwoofer has a single 4 ohm voice coil. The other subwoofer has dual 4 ohm voice coils. The dual voice coil subwoofer can have its coils wired in series to produce an 8 ohm load, or in parallel to produce a 2 ohm load. To complete this fictional example, we have an amplifier that will produce 400 watts into a 4 ohm load and 700 watts into a 2 ohm load. We have a small car and want to use a single 12 inch subwoofer in a large vented enclosure to get maximum low-frequency output. What sub should we use? If we use the single voice coil subwoofer, the amplifier will not make full power in the 4 ohm load. We should use the dual voice coil subwoofer and wire the voice coils in parallel to present the amp with a 2 ohm load. In this example, we have the same electronic equipment, but the vehicle is a large SUV. There is a lot of room for subwoofers, and the owner wants to list to reggae, loudly. The owner has listened to a friend’s system and found out that a pair of subs matches his listening preferences perfectly. Which subs should we use? 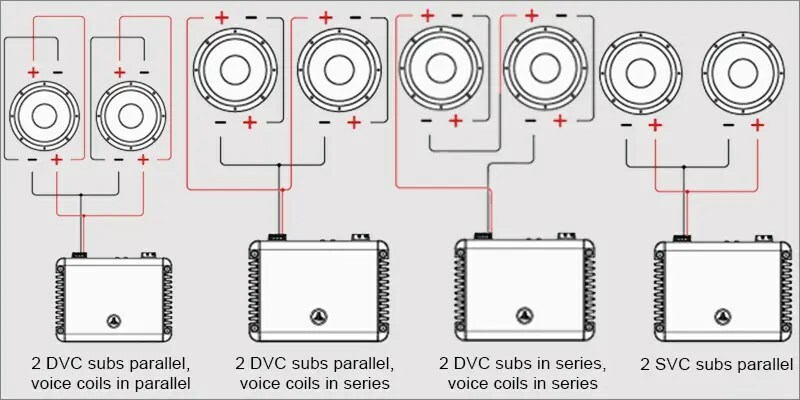 If we use the dual voice coil subs, we have three options for wiring the four (two on each sub) voice coils together. We could wire all the coils in parallel. Parallel wiring will present the amp with a 1 ohm load. Most likely, the amp will go into protection because the load is too low. We could wire all the coils in series to present the amp with a 16 ohm load – but that’s not going to happen. We could wire the voice coils on each subwoofer in series, then parallel the pair of subwoofers to get a 4 ohm load. A 4 ohm load is not ideal. If we use a pair of single voice coil subwoofers, however, and wire the subs in parallel, we get a 2 ohm load. Happy amp and happy customer! You can use as many subwoofers as you want on a single amplifier. You must use all the voice coils on each sub. If you need a 4 ohm load but have a dual 4 ohm sub, using only one coil is going to cause issues. Bad issues. Wire all the subwoofers you choose so the current going through each subwoofer is the same. In most cases, this means using pairs of subs. In the past, several companies offered dual 6 ohm voice coil subs that could be wired in groups of three to present amplifiers with standard load impedances of 1 or 4 ohms. 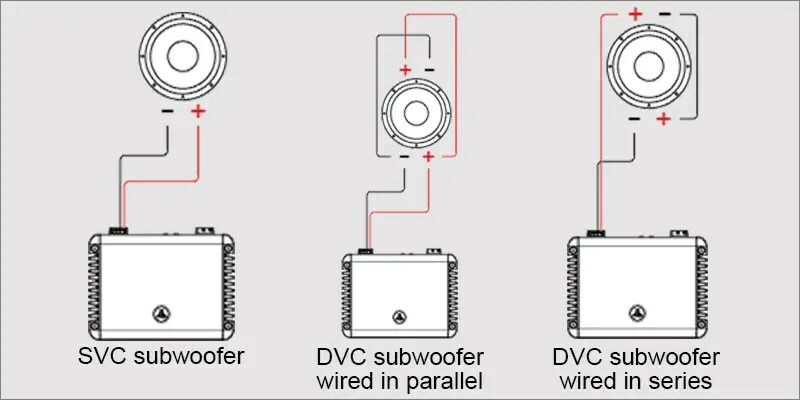 Do not wire one dual voice coil subs in series and one in parallel before connecting the subs together in parallel. You will get more current through the (parallel) low-impedance subwoofer. This imbalance will upset the performance of the enclosure and wreak havoc with the reliability and quality of your system. This is unrelated to the wiring of multiple subwoofers, but: Don’t mix and match different subwoofers. Each has its enclosure requirements and response characteristics. There is no way to guarantee that the output of two different subwoofers will sum positively at all frequencies. 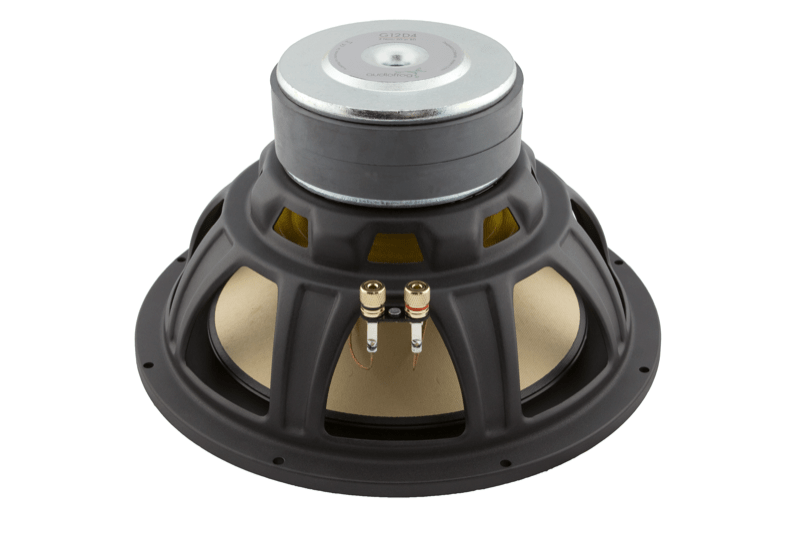 So, Which Voice Coil Configuration Is Better? The answer to the question “which is better” is neither. 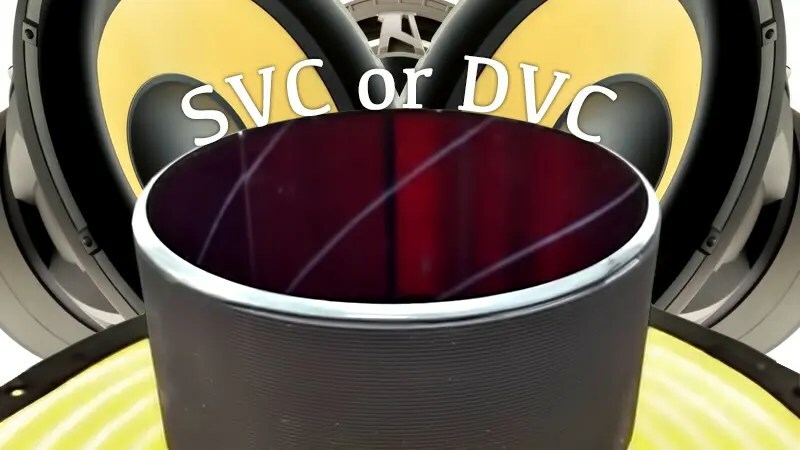 SVC and DVC subwoofers are simply two different options when buying. They are analogous to a tire manufacturer offering different-sized tires for different vehicles – there is an application for each. Adding a subwoofer system should be one of the very first things you do to upgrade a factory audio system. When you are ready to make the leap into the realism, impact and dynamics that a great subwoofer can add, drop by your local car audio specialist retailer. They would be happy to work with you to design a system that meets your performance expectations.